After a warm, sunny, and fun summer, leaves have changed and are falling, temperatures have dropped, and autumn is roaring along, with the specter of winter on the horizon. For many, autumn means hay rides and orchards, carving pumpkins, and enjoying seasonal goodies like cider and donuts. As with every season, autumn is full of unique things that make it special. But also like the other three seasons, autumn has its share of issues we’d rather not contend with. One of the biggest is the weather. As cooler air arrives and meets the last vestiges of summer’s mildness, weather systems pop up that can quickly turn sour and severe. The sudden swings in temperature, along with the wind, sleet, snow, and rain that can pop up have been referred to by troubadours and songwriters as The Witch of November. Usually, we are able to escape the brunt of these storms, but even normal inclement weather this time of year can manifest itself in your home in the form of drafts and chills. This poses an issue for a couple reasons. The first, and one that likely goes without saying, is that drafts make homes uncomfortable. Nobody wants to cozy up in their den or living room, to have an icy chill dance across them. It’s unpleasant, it’s disruptive, and something that shouldn’t happen. After all, we live in homes to avoid the elements, not give them new ways to harass us! The second issue, and something not everyone realizes, is that drafts cause unnecessary stress on your heating and cooling systems, which means unnecessary stress on your wallet. Whether your system is working to keep your home warm or cool, outside air getting in will have a disrupting effect on your thermostat and the normal operation of your system. If air is getting in, it also means it can get out, resulting in less-than-efficient operation. In addition to being uncomfortable, drafts and air leaks cost you money, and ignoring them with warmer clothes or blankets just doesn’t make sense, as your home requires more energy to operate at its desired baseline. Certainly, serious drafts and air leaks are issues that need to be handled professionally, whether that requires better insulation, weatherstripping, or improved construction. (For a more in-depth look at this topic, you can check out our previous post, here!) For some individuals, however – particularly renters – significant work isn’t something they can have control over. Other people may not be comfortable taking on these projects or have the money on hand for a potentially costly project. If you realize you’re battling drafts in your home, there is an affordable method to combat the issue that is easy enough for everyone to use: Draft Stoppers. The concept behind a Draft Stopper is simple – if you block the area where air enters your home, it’s not going to be able to get into your home! These long, tubular forms are able to be placed at the base of doors or windows, helping to block points of entry for drafts when thresholds may not be working well enough, or gaps are present. Just in time for the season, The Foam Factory has introduced their own line of Draft Stoppers, fantastic for any of the purposes previously mentioned. 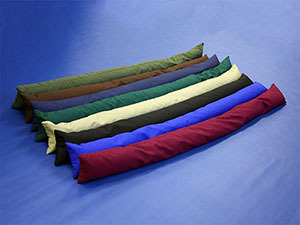 Available in two sizes – 36-1/2″ or 55-1/2″ long – you can keep your home a little cozier this season. Filled with polystyrene (EPS pellets), these Draft Stoppers are both insulating and able to be formed to the gap they’re trying to block. The shredded foam is loose enough to move around within the 100 percent cotton twill covers for a form-fit, while full enough to block the space sufficiently. In addition to temperature control, Draft Stoppers may have an added benefit for renters, too. Closing off the space at the bottom of your door may help prevent Gordie across the hall from stinking up your apartment with his nightly meal of fermented fish. 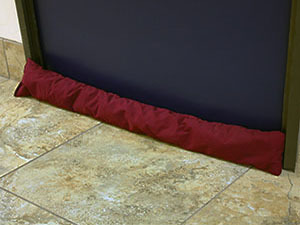 With Draft Stoppers, you can be more comfortable in your home, while saving money and energy. So when autumn and winter start howling outside, rest a little cozier knowing you’ve got a line of defense safely positioned at the bottom of your doors! *Note: In cold environments, it is important to maintain an appropriate baseline temperature to prevent issues such as freezing pipes, vapor, and other temperature-related damage or problems.